Last Sunday, the sixth annual “Adirondack Challenge” was held in Indian Lake. Basically, this was a three-day festival that celebrated the diversity of tourism in the Adirondacks. It had over 400 attendees, the tourism report for 2017 was announced. Apparently, between 2016 and 2017, tourism in the Adirondacks increased by almost half a MILLION people, which also translated into a 5.5% increase in revenue. The actual numbers for 2017 come in at approximately 12.5 million people, and 1.4 billion dollars. There’s always some policy being debated about in the Adirondacks, but the most recent one is about motorboats being allowed on both Weller Pond and Little Weller Pond. These are small ponds in the Saranac Lakes chain that are currently accessible by motorboats, and that have a few campsites on their shores. The Protect the Adirondacks organization is organizing a gathering of people on these ponds for a Canoe-in, as opposed to a Sit-in, for August 18th at 10 a.m. 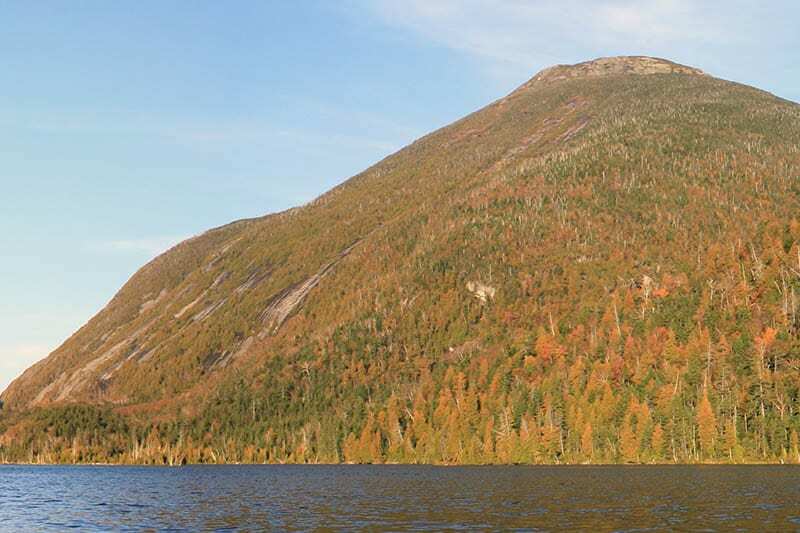 This will be the 20th year that Canoe-ins in the Adirondacks have been happening, and they have resulted in some success throughout those years. Danielle and Thom, one year ago, working as naturalists. 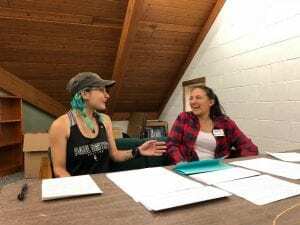 Danielle and Thompson are two recent Paul Smith’s College graduates who studied Environmental Science and Fisheries and Wildlife Science, respectively. Danielle is 21, from Rochester, NY, and has been coming to the Adirondacks since she was a few months old. Thompson is 22, from, well, everywhere, and has lived in the Adirondacks since she was 7. Both love the outdoors, reading, and the Disney movie Moana (seriously, it has great environmental undertones!). We first met at the beginning of summer 2017, when we were both hired as naturalists at the VIC. Since then, we’ve gotten into tons of shenanigans, adventures, and arguments over which Winchester brother is better. Danielle and Thom, two weeks ago, recording the first episode of Adirondack Naturalist. We think the history of the Adirondack Mountains is just incredible. The story starts over a billion years ago, when the original bedrock cooled and hardened at the surface of the Earth. Continental drift moved the Adirondacks from approximately at the equator to its current latitude, and also caused many valleys and rifts to form as our tectonic plate and the one most of Europe is on continue to drift away from each other. The area the Adirondacks is currently on used to be flat and covered with a shallow sea at one point. It rose because of the formation of a hot spot 10 million years ago deep under the surface (think formation of volcanoes—except without the volcano part), which is still causing our mountains to grow (evident by the fact that we very occasionally have mild earthquakes here). General map of the Adirondacks, its regions, roads, and large towns. When the Adirondack Park was first being established, one of the first maps of the boundary of the park was drawn in blue ink. The term “Blue Line” is now commonly used to describe the park and its border. Inside the Blue Line, there are 105 towns and villages, 3,000 lakes and ponds, about 30,000 miles of streams and rivers, more than 2,000 miles of hiking trails (including handicap accessible ones) and, included in the 46 High Peaks, the highest point in New York State (Mount Marcy)! If you’ve ever been to the Adirondacks, you are probably aware of how much there is to explore. We bet you’ll never be bored here! The Adirondacks are full of unexpected surprises. Would you have guessed that it used to be a destination for people with tuberculosis? Tuberculosis (TB), a bacterial disease in the lungs, brought a lot of people to this area who were searching for the “fresh air cure.” Cure cottages with large screened-in porches started popping up all over the Adirondacks in the late 1800s, but especially in the Saranac Lake area. Many of the people who came in the mid-1900s were veterans of the World Wars, since the use of mustard gas made them more susceptible to the bacteria. 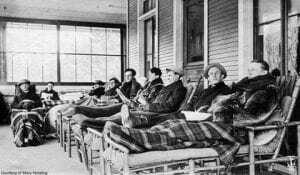 Photograph of TB patients on the porch of a cure cottage, where they spent most of their days. We mentioned Rabbit Island in our podcast, so here is a description of Dr. Edward Trudeau’s 1886 experiment: There were 15 rabbits in total; five were infected with TB and held in a small cage in “unpleasant living conditions,” five were not infected with TB ad kept in the exact same conditions, and the last five were also infected with TB, but were allowed to explore the island as they wished. The infected/confined group all died, the healthy/confined group all survived but looked malnourished and unhealthy, and the infected/free group all survived without issues. This simple experiment was meant to demonstrate that a person’s (or rabbit’s) living condition can influence the progression of a disease. Around the same time as the TB cure cottage craze, lots of hunting and trapping was taking place in the area. Can you believe how many mammals have been extirpated (meaning locally extinct, which is different from global extinction) from the Adirondacks? Even the New York State mammal, American beavers (Castor Canadensis), alongside moose (Alces alces), and timber wolves (Canis lupus) were extirpated during the settlement of the Adirondacks. Most of these extirpations are due to over hunting for the fur trade or for pest control. Only the beavers and the moose have successful recovery stories, while the timber wolves remain absent. This is probably because the presence of the eastern coyote (Canis latrans); it is thought that the coyote has filled the niche of the wolves, leaving no room for them within the Blue Line. What is your opinion on this; should wolves be reintroduced to the park? The Adirondacks has many different habitat types, including Northern Hardwoods (60% of the Park! ), mixed forests, boreal forest, alpine, and open water/wetlands (including bogs, fens, swamps, and marshes). At the VIC, we have every one of these habitat types except for the alpine zone. The boreal forest (also known as the Taiga) is named after Boreas, the Greek god of the cold north wind and the bringer of winter. He is described as strong and violently tempered, similar to the winters in this biome. The boreal forest makes up roughly 29% of the world’s forest cover and acts as an important carbon sink for the world’s atmosphere. Since most of the trees in a boreal forest are conifers, they are capable of photosynthesizing throughout the winter, which helps with carbon sequestration. Many of the understory plants in this biome are comfortable growing in acidic conditions, and lots of different berries can be found along forest floors and edges. Blueberries and raspberries are just about out of season, but keep your eyes peeled for cranberries right around the corner! 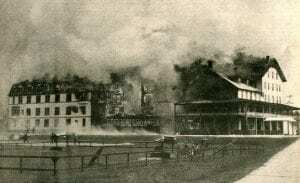 Photograph of the 1930s fire that completely destroyed the main building of the Paul Smith’s Hotel. It only took hours for this fire to consume the building. The history of Paul Smith’s College (PSC) is extremely interesting and important to us, too. Before it was a college, however, it was a hotel opened in 1859 by a man named Apollos (or Paul) Smith. This was a popular place for wealthy men to come and go hunting or fishing on long vacations, but it wasn’t a proper place to bring their families. The hotel expanded and changed in order to accommodate this, so that the entire family could come for weeks at a time. The hotel expanded multiple times, and was such a popular destination that people like Grover Cleveland, Theodore Roosevelt, Calvin Coolidge, and P.T. Barnum regularly came. Eventually, after Paul’s death in 1912, one of his sons, Phelps took over the business. In 1930, the entire main building of the hotel burned down to the ground, and was never rebuilt as a hotel. Seven years later, Phelps died, but left in his will that there should be a college built there instead, “to be forever known as Paul Smith’s College,” after his father and the long history of the hotel. Thompson, Bill KcKibben, and Danielle after the Adirondack Center for Writing’s program, An Evening with Bill McKibben, where he read excerpts from his new novel Radio Free Vermont. Paul Smith’s College, the VIC, and even the town of Saranac Lake are all great examples of environmentalism within the Adirondack Park. Due to its level of classification as a forest preserve, the park has drawn a culture of environmental protection and stewardship since its establishment. This culture is not only known by the park’s residents, but is recognized by famous environmentalists such as Bill McKibben. To hear what he has to say about grassroots resistance within the park, jump to 38:00. 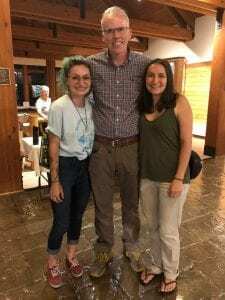 Thompson, Bill McKibben, and Danielle after the Adirondack Center for Writing’s program, An Evening with Bill McKibben, where he read excerpts from his new novel Radio Free Vermont. If we’ve managed to spark your passion and curiosity for the Adirondacks and all of their glory, then we hope you’ll stay tuned for more future episodes, and share the ones you like with your friends and family! We feel that this place is too magical to keep secret, and we can’t wait to continue discovering new topics to discuss with you all. 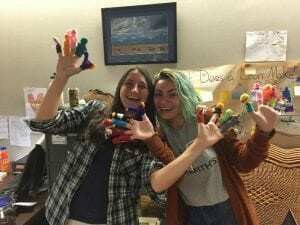 Are you curious about a natural history topic? Drop a suggestion in the comments!